Dave Reed, a member of VFAC and also the Phoenix Running Club, died in 2008, after contacting a deadly infection. He was only 54. At that time VFAC renamed our Spring race as the “Dave Reed Spring Classic” and his brother Mark donated a trophy named in his honour. This trophy was presented to the Age Graded Winner of the race – Male or Female, Open or Master. When we stopped organizing the Dave Reed Spring Classic after 2013 we wanted to continue remembering Dave, so we brought the Age Graded Award and Trophy to the Summerfast 10k. The trophy honouring Dave will be awarded again this year. Shortly after his death, Nancy Tinari, a longtime friend of Dave’s and also a Phoenix Running Club member, wrote about running with Dave. Her article about doing tempo runs with Dave in the early 1980s can be found on her blog. Dave Reed will always be remembered for his infectious enthusiasm for running. Though he was a superb athlete in many sports, some of his favourites being hockey, downhill skiing, baseball and golf, running was the leading passion of his life. He never quite made it to the top as an open competitor, but instead blossomed as a masters runner. Among Dave’s top achievements as a master were a 2:00 800m, masters victories in prestigious races such as the Hamilton Spectator Games 3,000m and the U.S. 5K Road Race Championships, and repeated wins and top-3 performances in the Ambleside Masters Mile road race in Vancouver. Dave still holds the course record in the latter event, a time of 4:17 for the downhill mile. As a “young” master, Dave ran many 5Ks in the 15:10 to 15:40 range, and he also achieved sub-4:30 times in legitimate mile races. Those of us who knew Dave understood that in many ways, he was a big kid who never entirely grew up. He had a child’s ability to get lost completely in the joy and excitement of a moment of play, and he relived the high moments of races with the single-mindedness of a child. He was legendary for his ability to relate, in detail, every split time of his own performances, as well as times of other athletes he supported and admired. Dave was always enthusiastic about helping other talented runners achieve their goals. He also loved working with kids, and gave his time generously as a sports mentor and companion to the children of his running friends. All of us who raced against Dave on the road will remember his love of running with the leading pack, even if he could only hold on for the first mile or so at his favourite race distance, the 5K. Speed was Dave’s forte, though, and he was an inspirational figure on the track, with a smooth and graceful running style. He never lost his ability to “switch gears” and put on a display of cunningly-planned speed. In life, Dave sprinted to the finish too soon. He died, tragically, of a staphylococcus infection that rapidly attacked his body. 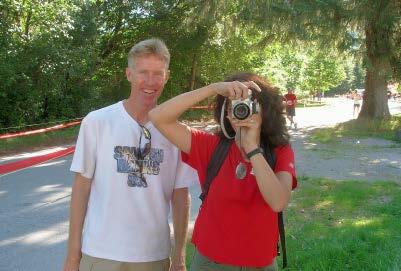 He will be greatly missed by his many running friends in Vancouver, Victoria, Toronto and places beyond.